This post is a short review of my gaming business activity for the year. In 2014 I ran 5 Kickstarter campaigns. They were all successful, with some making several times the amount set as a funding goal. Kickstarter has helped me build a range of printed pads and notebooks that I am immensely proud of. I cannot think of any better way to fund and market such niche products. All of my Kickstarter projects are carefully planned in advance. I usually set aside about 15% of the funding as a contingency pot for the project, which if not used up then becomes my profit. In the planning stage I look at a vast array of funding outcomes from 100% all the way up to 2000% (20 times the funding goal). My golden rule for Kickstarter is: Only start a new project after all the rewards from the previous one have been posted. 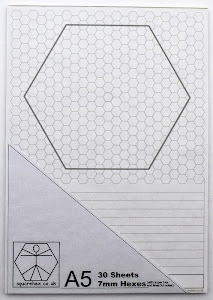 This year I also ran my first pre-order for print run of Isometric Mapping Pads. Although it was not as successful as an equivalent Kickstarter, the pre-orders still accounted for around 30% of the print run. It also allowed a much faster turnaround than a Kickstarter making it ideal for smaller projects. I've taken stands at 6 UK conventions this year. Attending the shows is a great way to reach new customers. They can be hard work, but having done quite a few of them now, I'm finding the preparations for them a lot easier. They are also made a lot easier thanks to the help of my wife, who's assisted me at all of this year's shows. One thing I have found is that it is almost impossible to guess what will and won't sell at a show. We've sold out of an item at one show, and then stocked up for the next one and sold none of that item. Selecting what to take to shows is a very careful balance of what will fit in our small hatchback and what can be merchandised on a 2 metre stand. We tend to overload both the car and the stand. The Squarehex website is something that I would like to have developed further this year. For now though it remains just a basic shop front open to customers from all around the globe. It features all the products created from past Kickstarters and a small selection of games and accessories. Squarehex as a business started in Spring 2013. Before that I had published issues of Oubliette (first issue was 2010) but that was very much a hobby activity. With Squarehex I planned to run it as a business, but one without any financial pressure to meet a given level of revenue or profit. My hope was that in the first year the business would make enough money to cover the its internet and storage costs. It achieved this with ease and this year it looks set to do better again. The growth of the business has also meant that the stock has moved from a 75 sq' storage unit to a 160 sq' unit. Whilst the scale of the business is modest, I've still made sure that it is run correctly. For every Kickstarter I keep full accounts detailing income and expenditure along with profit and loss. Every project is also carefully planned and budgeted for. I want to make sure that the business is sustainable, and know from watching other Kickstarters that one poorly planned project can be lethal to a business in the gaming industry. So that was this year, if I get a chance I'll post a follow-up article in the New Year detailing my plans for 2015. Thank you to everyone that has backed my projects, bought things from the webstore, or from our stand at a show this year. Also look out for the Squarehex January Sale which starts on New Year's Eve. A5 Gamer's Notebooks Kickstarter is Live! 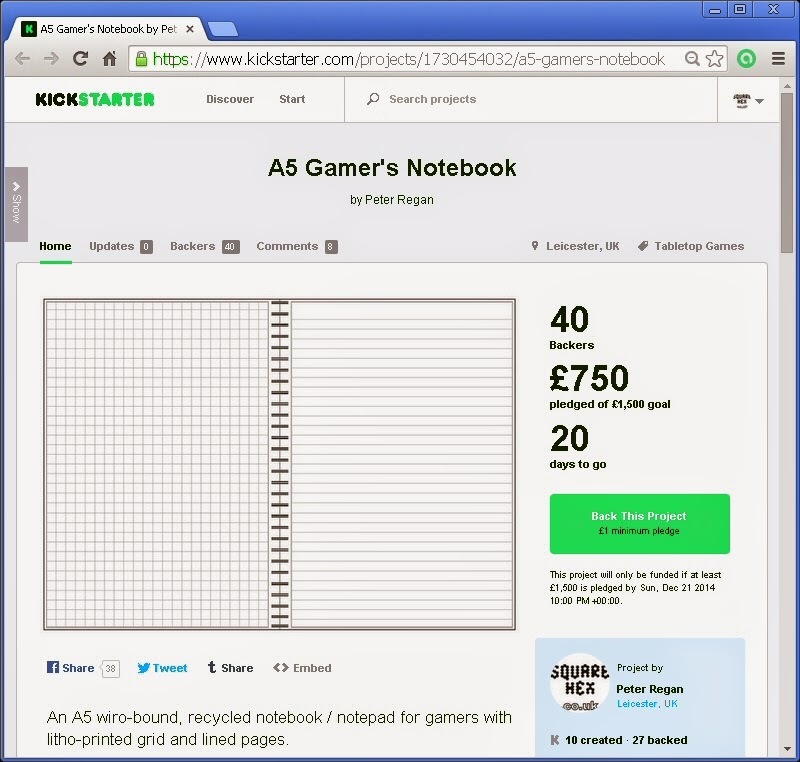 Following on from my last project to print A6 Gamer's Notebooks, I've now launched a new campaign to fund an A5 version.